Imagine diving into a world in which you and your fellow divers descend equipped with bright hand held underwater lights. The lights attract plankton which in turn attracts the Manta Rays. This shows a true symbiotic relationship as the Mantas eat the plankton and the humans get to enjoy the show. There are 214 named and identified Mantas that you can meet on any given night. This dive is very safe - the Manta's are known for their gentle attitudes and fascinating behavior. The Manta Ray Night Dive on the Kona Coast of Hawaii is something that should not be missed. You will get first-hand experience as you watch their fascinating behavior and their gentle attitudes. 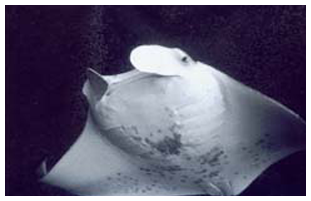 We provide all equipment for your comfort on your manta ray night dive. Masks, fins, wet suits, and under water dive lights, snack, water and hot beverages are provided after each dive. Our U.S.C.G. certifitied high speed custom diving boat is fast, fun and stable with plenty of shade and comfortable seating. Transportation not included. Must be a certified diver to book. Gear rented separately for about per set. You will want to bring a towel and some extra cash for purchases.